I've said it before and I will say it again. The best part of what I do as a blogger, to me, is the amazing people I get to meet. I had the pleasure of attending a dinner party on Wednesday night for Urban Decay's Revolution lipstick launch. Urban Decay is personally one of my favorite brands of makeup, I use their Naked 2 eye shadow on a daily basis. So for me to be able to get a first look at their fall collection was super exciting. The dinner was held at Rayuela in NYC. The energy in the room was amazing. Being in a room full of successful Latinas is truly beyond inspiring to me. The women I finally got to meet are people I am inspired by and follow on a daily basis. I have read up on them and it was just such an honor to share my blogging story and chat with them. We were greeted with some refreshing and delicious cocktails, infused with rose petals... they were to die for. And I loved their fun name: Badass Luxury. How fab is that? The centerpieces were gorgeous red roses and of course Urban Decay Revolution makeup! The tones and even the packaging of the products were so pretty. Every detail was just exquisite. Lo he mencionado antes y lo dire de nuevo. Lo que mas me encanta de lo que yo hago es, ante que nada, con las personas que tengo el gusto de conocer. El dia miercoles tuve el honor de asistir a la cena de Urban Decay Revolution lipstick. Urban Decay es una de mis marcas favoritas de maquillaje por eso cuando me invitaron no lo pense dos veces y acepte. La cena fue en el restaurante Rayuela de NYC. No les puedo describir la energia que hubo en el ambiente. Estar en un cuarto con mujeres tan exitosas, la verdad es tremenda inspiracion para mi. Nos dieron la bienvenida con unos cockteles deliciosos llamados Badass Luxury - tenian hasta petalos de rosas! Las mesas fueron adornadas con bellas rosas rojas y por supuesto el lindo maquillaje de Urban Decay. Los tonos de los lapices labiales estan hermosos! Y los envases super lindos y detallosos. Cada detalle fue simplemente bello. 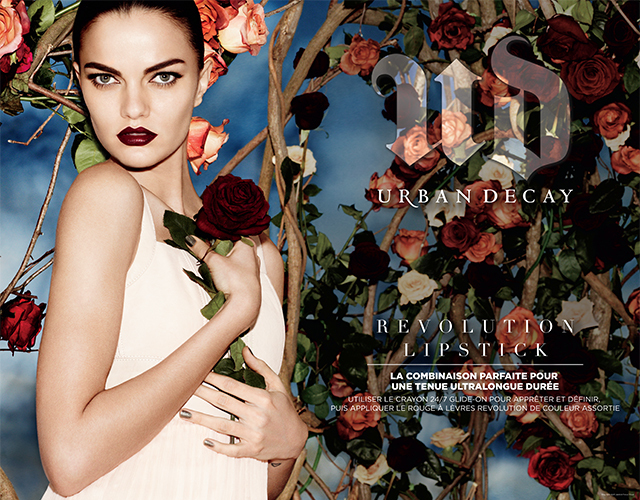 Urban Decay launched 22 shades of Revolution Lipsticks. From deep mauves to amazing day to day nudes and of course, my favorite, shades of reds and corals! The lipsticks are creamy and pigment-powered, the colors are intense and vibrant - just like every thing Urban Decay creates. You will feel a soft and rich texture when you apply the lipstick. There are colors for women of all skin tones. I can guarantee you, you will find a favorite. The pigmentation is so intense that you don't need to apply over and over with one application you will get the full perfect color you see on the stick. The even have a hydrating technique: Maxi-Lip which hydrates and nourishes your lips while making them look fuller and more plump. As well as a nourishing blend of jojoba oil, avocado oil, cocoa butter and shea butter which keeps lips super moisturized and cushiony soft. Urban Decay lanzo a el mercado su nueva colleccion de lapices labiales llamados Revolution lipsticks. Los colores varian desde intensos colores tipo uva a colores neutrales que puedes usar de dia a dia. Y por supuesto mis favoritos los bellos rojos y exquisitos anaranjados. Los labiales tienen una formula cremosa y pigmentos intensos con brillos como ningun otro. Te encantaran no tan solo los colores pero lo hidratante que son, con su tecnologia llamada Maxi-Lip recibiras hidratacion y definicion y a las ves hara que tus labios se vean mas rellenos y suaves. Por supuuesto tambien tienen una combinancion nutritiva de aceite de jojoba, aceite de aguacate, manteca de cacao y manteca de katire. Hasta el estuche es super lindo, tiene un look metalico super moderno y atractivo con un toque muy lujoso. One detail I really loved was that the lip-liners are named exactly as the lipsticks. Such a simple idea but so brilliants at the same time. Saves times and makes a woman's life much easier. My favorite shades are Streak (corals), F Bomb (reds) and Naked 2 (neutrals). Un detalle que me encanto fue que todos los delineadores de labio fueron nombrados exactamente como los lapices labiales. Una idea tan simple pero tan brillante. Nos hace la vida mas facil! Mis tonos favoritos son Streak (corales), F Bomb (rojos) and Naked 2 (neutrales). The beautiful and inspiring Maria Gomez-Ramirez telling us a bit about the products and welcoming us to the event. Maria, you have been amazing and I can't wait to see you again. La bella Maria Gomez-Ramirez dandonos la bienvenida y hablandonos sobre los productos. Maria, espero vernos pronto de nuevo. We had to pleasure of meeting the beautiful Liseth Perez-Almeida from El Diario NY - you are so lovely and sweet Liseth can't wait to see you again and chat a little more. Tuve el placer de conocer a Liseth Perez-Almeida de El Diario NY un gustaso conocerte Liseth, eres muy linda y dulce persona. Espero vernos muy pronto nuevamente. And of course a pic with my blogger babes Nadia and Naty, we had such a fun time. From our complimentary car service to our fab cocktails, delicious dinner... to meeting and chatting with successful and inspiring Latinas and of course the amazing gifts, I couldn't have asked for a better night. Cheers to many more fun and fabulous events! PS: I will be doing a full post on my outfit from this night. Stay tuned chicas! You won't believe how much I paid for this skirt! Great post babe! This was such a fun and fab night and I can't wait for whatever comes next. :) I am going to steal the pics of us as the bottom! What a lovely event! I love that you were able to connect with and meet so many different accomplished Latinas!